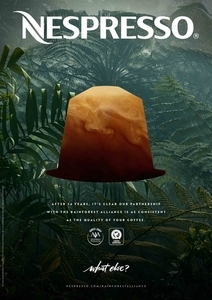 LAUSANNE, Switzerland,, Sep. 29 /CSRwire/ - Today, Nespresso has announced the inclusion of the Rainforest Alliance Certified™ seal on all Nespresso permanent Grand Crus coffee sleeves to help build awareness of the AAA Sustainable Quality™ Program. Launched in 2003, the Nespresso AAA Sustainable Quality™ Program is a tailor-made program that combines the Rainforest Alliance’s sustainability criteria with the quality coffee credentials Nespresso is known for. To celebrate and highlight this important 14-year partnership, Nespresso has updated its packaging to include the Rainforest Alliance Certified™ seal next to the AAA logo, with the aim of highlighting the importance of sustainable quality coffee to consumers. The Rainforest Alliance’s mission is to conserve biodiversity and help ensure sustainable livelihoods by transforming land-use practices, business practices, and consumer behaviour. The AAA program was designed to incorporate these criteria and help improve the quality of life for farmers, their families and communities while also protecting the environment. This is done through a holistic approach, which includes auditing farms against the newly revised Sustainable Agriculture Network (SAN) standards to help ensure best agricultural practices and direct training through on-the-ground agronomists who help them to make their farms more productive and profitable. The AAA program goes beyond Rainforest Alliance certification by also focusing on high coffee quality and price premiums being paid so farmers can produce coffee that meets the Nespresso standards on taste and aroma while protecting the wellbeing of farmers and the environment. Currently, 80% of Nespresso coffee is sourced from AAA farms and it is estimated that over 40% of all our coffee is from Rainforest Alliance Certified™ farms. All coffee sleeves across the brand’s permanent Grand Crus range will now clearly label this, to show Nespresso’s commitment to not only sustainability and farmer welfare, but also meaningful and long-term partnerships. Nestlé Nespresso SA is the pioneer and reference for highest-quality portioned coffee. The company works with more than 70,000 farmers in 12 countries through its AAA Sustainable Quality™ Program to embed sustainability practices on farms and the surrounding landscapes. Launched in 2003 in collaboration with The Rainforest Alliance, the program helps to improve the yield and quality of harvests, ensuring a sustainable supply of high quality coffee and improving livelihoods of farmers and their communities. Headquartered in Lausanne, Switzerland, Nespresso operates in 69 countries and has more than 12,000 employees. In 2016, it operated a global retail network of more than 600 boutiques. For more information, visit the Nespresso corporate website: www.nestle-nespresso.com. The Rainforest Alliance is an international nonprofit organization working around the world to conserve biodiversity and natural resources and ensure sustainable livelihoods. Founded in 1987, the Rainforest Alliance focuses on creative, pragmatic collaboration with foresters, farmers, businesses, and workers to help rebalance the planet by building strong forests and healthy communities worldwide. To learn more visit www.rainforest-alliance.org. Julie de Ferron Global Brand PR Manager | Nestlé Nespresso S.A.